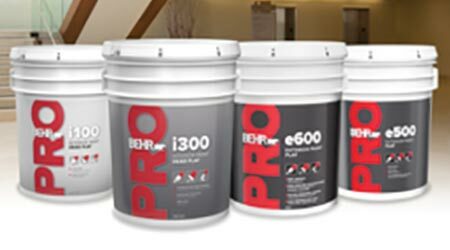 Exterior paints in the new Behr Pro e500 line are professional-grade, 100 percent acrylic, and water-based. They are designed for commercial applications. The paints feature high hide and coverage, are optimized for spray application, offer good touch up, are suitable for low-temperature application down to 35 degrees, are tintable to light, medium and deep colors, and are available in flat and satin finishes in 5-gallon sizes.